The Marche (or Le Marche, as it is also known) is in central Italy. It is quite a hilly region, and not that agricultural. Though it's fairly narrow, the coastal area along the Adriatic Sea is the region's most important feature. Most of the major cities are located in the coastal plain areas. There are churches and villas with art by Renaissance masters like Piero della Francesca throughout the region. It borders Tuscany, Lazio, Umbria, Abruzzo and San Marino. A stretch of land wedged between the Apennines and the Adriatic, the Marche is particularly known for its seaside resorts, which are especially lively on summer nights when restaurants and bars are open late and there is plenty of street entertainment. The towns on the coast are more modern than ones closer to the mountains. Many of these towns in the hinterlands have retained much of their medieval charm. Senigallia is an especially popular beach resort, with its fine velvety sand. There is a good harbor in the region's capital, Ancona, but most harbors here are small ones that serve fishing boats. 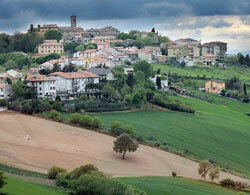 Textiles, leather goods and paper are manufactured in the Marche, which also has a strong agricultural industry.